The Pro client of Elvis 6 relies heavily on metadata so it is important to be aware of what it is and how to use it. All this information is stored within the file itself, meaning that when you move the file (for example by sending it to someone else or by uploading it to Elvis Pro), the metadata is moved with it. You will see metadata displayed throughout Elvis Pro and use metadata whenever you perform a search. When you have sufficient access rights, you can also change metadata. The more metadata is added to a file, the more likely it is that the file is found when searching for it. Add a description in your own words of what can be seen in the image or video. Add copyright information to show who the owner of the image or video is including contact details. Use tags to describe various aspects of the content of a file. A color image of a red apple taken in a studio could for example have the tags: "apple", "fruit", "red", "food", "healthy eating", "photography", "studio shot", "color image". Add a rating when you are asked to review a selection of images. You could give an image that you prefer to see used as the opening image of a story 5 stars while giving your second choice 4 stars and your third choice 3 stars. 1. Search field. When entering a search term in the Search field, Elvis Pro will find all files that have that term anywhere in the metadata. 2. Found files. 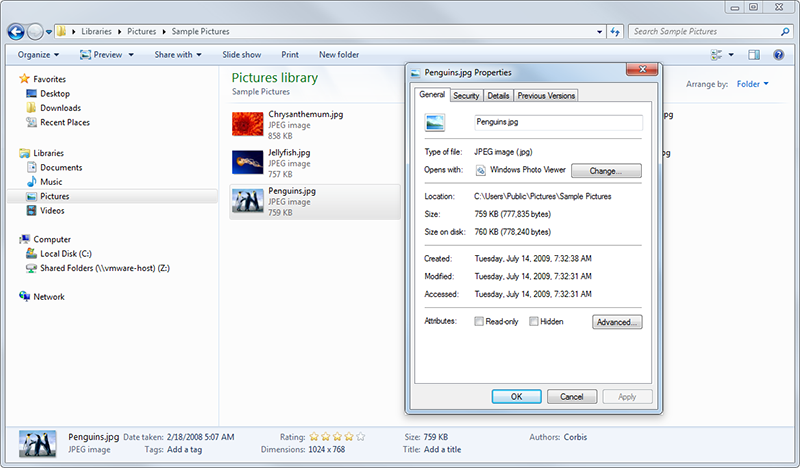 Basic metadata such as the file name and rating is displayed together with the preview of the file. 3. Filter panel. After performing a search, the results can be further narrowed down by applying a filter for example by selecting a tag. This is also based on metadata. 4. Metadata panel. When one or more files are selected, the metadata of these files is shown in the Metadata panel. When you want to edit the metadata, you would typically do so in this panel. When an asset is checked-out by a user, it should not be possible for other users to make changes to the content of that file. This rule does not apply to the metadata of the checked-out asset: it is still possible to edit the metadata by using the Pro client while the asset is checked-out. Info: This feature requires Elvis 6.17 or higher. In these versions, the fields in the Metadata panel are editable for a checked-out asset; in older versions, these fields are locked for a checked-out asset. When the checked-out asset is checked-in again, any changes to the metadata of the asset that were made by other users while the asset was checked-out are kept; any changes to the metadata of the asset that were made by the user who checked-out the asset are lost. 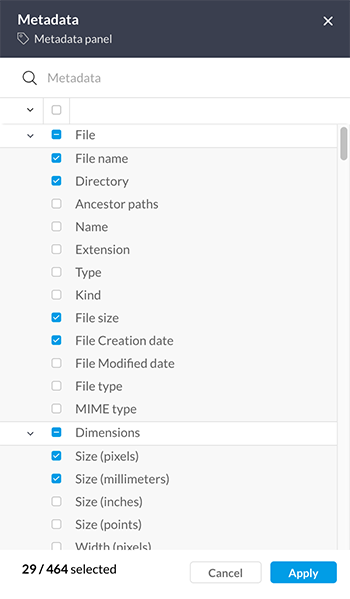 Elvis Pro contains more than 400 different metadata fields. Showing the fields that you regularly work with while hiding those that you don't need makes sure that you work quickly and efficiently in Elvis Pro. You can change the displayed metadata fields in the Filter panel, the Search results panel and the Metadata panel. Step 1. In any of these areas, click the Configure Metadata icon in the top right corner. Figure: The Configure Metadata icon in the Metadata panel. Step 2. In the panel that appears, select the metadata fields that you want to show and clear the selections for the metadata fields that you want to hide. Use the Search field to quickly find fields. Tip: To view information about the field in a tooltip, hover your mouse over the name. To streamline this process, a metadata field in Elvis can be set up to use a 'taxonomy list' from which the user can choose a predefined value to use. This is typically a list in a hierarchical structure. Using taxonomies saves users from having to enter the term manually and thereby ensures consistent input. For more information, see Using taxonomy values to populate metadata fields in Elvis 6. This article describes how to work with taxonomies in the Elvis Pro client. 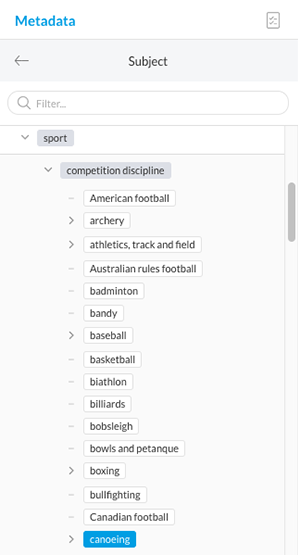 As with all other metadata, taxonomies can be added in the Metadata panel and searched on in the Filter. Metadata fields that are linked to a taxonomy list can be recognized by the '>' character on the right side of the field. Figure: Metadata fields that are linked to a taxonomy list can be recognized by a '>' character. Clicking the field will open the Taxonomy Panel that contains the Taxonomy Tree for that field. It is used for viewing which values are assigned to that field, assigning new values or removing assigned values. Step 1. 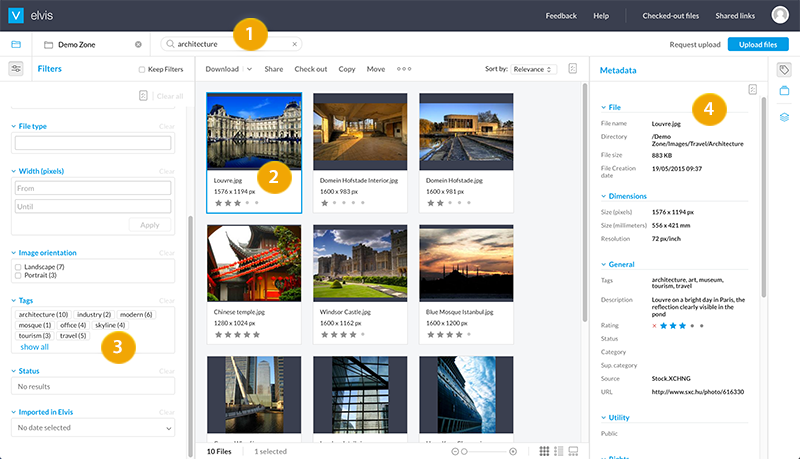 Select one or more assets to which you want to add taxonomy values. Step 2. Access the Metadata panel and click a field that has taxonomy assigned to it. The Taxonomy Panel that contains the Taxonomy Tree for that field appears. Step 3. Locate the value that you want to add by using the Filter field and / or by expanding grouped values. Tip: When using the filter, you can type any part of a word. For example: 'eco' will find 'economy' as well as 'reconstruction'. Step 4. Click the value that you want to assign. Tip: Click it again to remove the assignment. Note: Depending on how Elvis is configured, you can either select a single value or multiple values; and you can either select a value from any level of the structure or only from the lowest level. Select a different asset or de-select the currently selected assets by clicking an empty area in the search results pane. 26 June 2018: Added section 'Metadata and checked-out assets'.